Jicama (Pachyrhizus erosus) of the fabaceae or leguminosae family is a short-lived perennial, often grown as an annual leguminous climbing vine, which during short days will flower, produce long, inedible pods, and develop tuberous roots. These are few in number per plant, usually spherical, but often lobed, and weighing several kilos per plant. The flesh of the root is white and crisp, even after cooking, and is covered with a tan skin or cortex, which is easily removed by peeling. 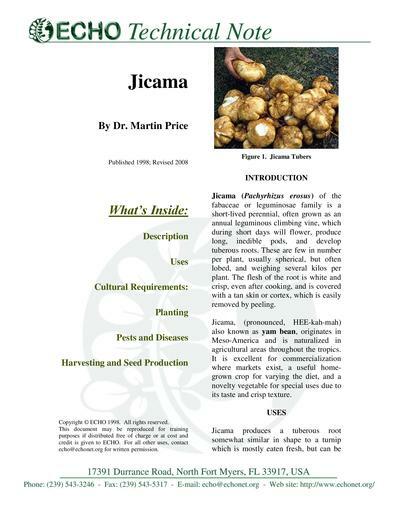 Jicama, (pronounced, HEE-kah-mah) also known as yam bean, originates in Meso-America and is naturalized in agricultural areas throughout the tropics. It is excellent for commercialization where markets exist, a useful home-grown crop for varying the diet, and a novelty vegetable for special uses due to its taste and crisp texture.